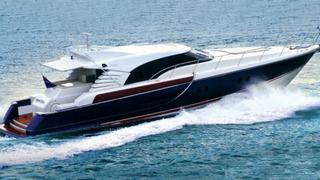 Paul McNeill at 37 South in New Zealand sends in a short note about a price reduction on his central listing, the 24.3m fast motor yacht Crystal Blue. Built by Evolution Yachts in 2006 to a design by Sam Sorgiovanni, she sleeps eight guests in four cabins plus two crew while twin 1360hp MTU engines give her a blistering performance of speeds up to 30 knots. Available to view at the forthcoming Auckland Boat Show, Crystal Blue's asking price is now down from NZ$3,500,000 to NZ$2,950,000.